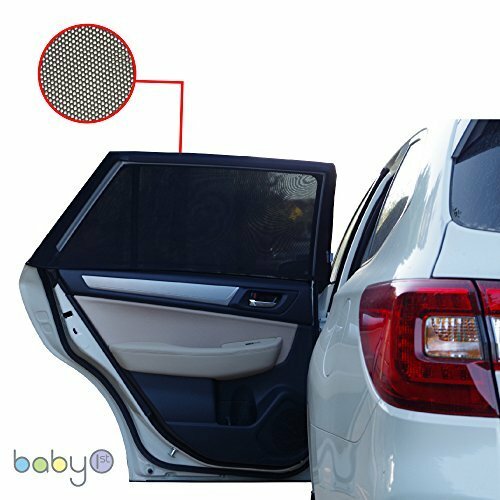 UNIVERSAL FIT CAR SIDE WINDOW SUN SHADES -Protect Your Babies and Kids from UV | Easy Fit | Fits All (99%) Models | 2 Pack + TRAVEL E-BOOK INCLUDED!! The Car Window Sun Shade Is The Best Purchase You Could Make Today! It will protect your kids' sensitive skin from the sun. It will keep the temperature on the back seats cool and safe. It will allow the air flow so your kids can still feel the breeze. Your kids will be able to read or watch movies without sun glare. The car window sun protection will absorb up to 98% of the harmful sunrays, according to the Australian Radiation Protection Agency. Your children's safety is your number one priority, and this UV protection shade is here to help you keep them protected. The window will be completely covered and your children will be safe under the cool shade of the car side sun shade. The car window sun protection is built to perfectly fit and cover the side windows all car models. The pack includes 2 car side sun shades, so that you can install them on both sides of your car. The high quality material is stretchy and unbelievably durable. You will never have to replace it! Along with the side window sun protection, you will also get an e-book as a free bonus gift. The book will show you many different games that you can play with your kids during car rides. Don't Hold Back! Click The "Add to Cart" Button NOW! UV PROTECTION: Absorbs upto 98% of harmful UV sunrays. Tested and certified by the Australian Radiation Protection and Nuclear Safety Agency. EASY TO INSTALL AND REMOVE: Effortlessly slide our sun cover on your car window frame and enjoy essential car sun protection! When not in use can be easily folded and kept in any car storage compartment. COMPATIBLE WITH ALL CARS: The car rear side shade can fit to any car model and vehicle. It is stretchy and, once you install it, it will stay in place. UNIQUE DOUBLE LAYER DESIGN: This feature enables your window to be opened providing a fresh flow of air whilst still providing shade,it also reduces heat in car, even when parked! So, no more putting baby in with burning metal parts, as the seat is in the shade the whole time. The double layer also creates the highest UV protection of all car shades for your kids, children, babies and animals. SAFE AND STRESS FREE DRIVE AND BLACK FRIDAY JOY/: With our sun blinds for kids, your baby can sleep undisturbed by the sun on every journey. Kids and passengers won't suffer from the sun's rays so you can enjoy the ride and keep cool. 2 pieces provided for complete piece of mind. All your pets and dogs will enjoy a lovely flow of fresh air and a cool car. If you have any questions about this product by BABY 1ST, contact us by completing and submitting the form below. If you are looking for a specif part number, please include it with your message.